• Fulbright English Teaching Assistantship: Emory’s internal application deadline is Sept. 12, 2019. • Fulbright Research / Study Grant: Emory’s internal pre-application deadline is June 6, 2019. Learn about applying for Fulbrights and other external fellowships and grants through Laney Graduate School. Emory University is a top producer nationally of students and recent alumni who receive U.S. Fulbright awards and a leading producer of Peace Corps volunteers, according to rankings in The Chronicle of Higher Education. Both programs provide resources and support for exceptional students to conduct research, study or teach abroad. Emory had 14 students or recent alumni (who applied as students) receive Fulbright awards to teach or conduct research abroad for 2018-19, which makes Emory a top producer nationally among research institutions, according to the Chronicle’s Top Producers of Fulbright U.S. Scholars and Students list. 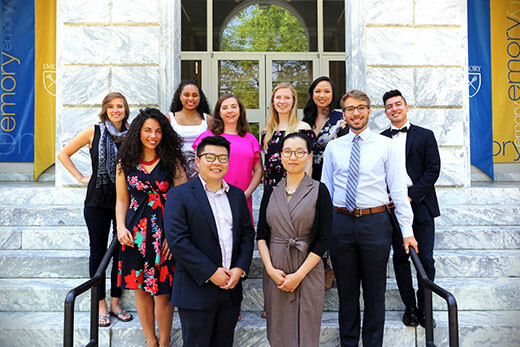 “The students and alumni selected for the Fulbright program provide a wonderful illustration of Emory’s broad academic strengths, as well as the campus culture of servant leadership,” says Megan Friddle, director of Emory’s National Scholarships and Fellowships Program. Emory ranks No. 12 among medium-sized colleges and universities on this year’s Top Producers of Peace Corps Volunteers list, also published by the Chronicle. There are 23 Emory students currently volunteering in countries around the world. This is the 10th consecutive year that Emory has ranked among the top 25 medium-sized schools for Peace Corps volunteers, rising steadily in the rankings since 2010, when it ranked No. 25. Since the Peace Corps’ founding in 1961, more than 560 alumni from Emory have served abroad as volunteers.